We are back for the 6th Dirty Devil Stampede and this year promises to be the biggest and best yet! 18th & 19th January 2020. 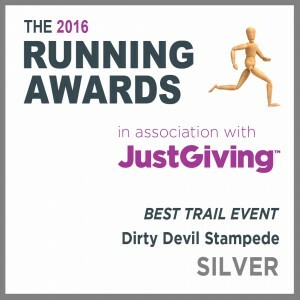 …then Sundays race will be split in to two events The Dirty Devil Stampede 10k and The Dirty Devil Double – yep, it’s the 21k’ish half marathon run for the more demanding and down right dirty runner! – Anyone 15 and over, can run around this event without the pressure of being timed and being lapped by the racing snakes- this will be an event for all who want an introduction to mud running in a relatively safe environment. Minimum age for this event is 8 – children aged between 8 and 14 will need to twist the arm of a responsible adult (adult must be 18 or over) to enter this race. No Adult – No Race. This multi terrain run of the new much longer 1 or 2 loop course takes you around the iconic location of the Bovington Tank training ground, land reserved for army training only to which we have secured the ultimate in mud running events in the South West. A 2020 Dirty Devil custom Buff & Finishers Medal will be given to all who complete the course. To see if its for you click THIS Youtube button. If you want a great race in an outstanding location enter now! Or simply watch the video below or go to our facebook page for photos, reviews and comments. RACE WILL START AT 12:00 Saturday 10:00 Sunday – SO DON’T BE LATE GETTING THERE. On the day entries – there won’t be any, this will sell out so be quick in getting a place. 5k Fun Run Registration – This will take place from 10am on Saturday morning till 11:30 – you will need to come and check in at the RACE HQ tents to be marked off our list of attendees, hand in your signed waiver and collect your wrist band – you will not receive anything in the post for this race as it isn’t timed. Who can take part? – If you are 15 and over you can take part in this event as an individual. Minimum age for this event is 8 – children aged between 8 and 14 will need to twist the arm of a responsible adult (adult must be 18 or over) them’s the rules kids! Minimum age for the 10k and Dirty Devil Double events will be 15 – if you are under age then Saturdays run is for you. There will be a maximum limit of two children per adult – you must all stay together for the entire run. The Dirty Devil Stampede 10k & Dirty Devil Double – your race will start at 10:30 Sunday morning. Registration – This will take place from 08:30am on Sunday morning till 10:00 – you will not need to come and check in at the RACE HQ tents – you will receive your race numbers with foam attached timing chips in the post for this race as it is timed. Entry to site will close at 11:30 Saturday 10:00 Sunday so you have plenty of time to get parked, changed and attend the race briefing at 11:50 Saturday and 10:20 Sunday – the race will start at 12:00 Saturday and 10:30 Sunday even if you are not there. Bring Inflatable friends, they are all welcome – crocodiles, sheep, rubber rings, hammers and the like. Also, please remember, we operate on the following rules – in any way you become abusive or aggressive to any employee or volunteer of BustinSkin Events Ltd or any other participant taking part in the event, we will terminate your participation in the event, You will not be entitled to a refund, your results or any further explanation. See below for clarification……. Rule 1, The Race Director is in charge and what he says goes, full stop. Rule 2, Listen to the race brief, don’t be abusive to any marshal or competitor, pay attention to what you are told, follow the signs for your race and understand the course as laid out. CONTINUE ON THAT ROAD UNTIL YOU REACH THE NOISE!